June 20, 2011 By This post may contain affiliate links. 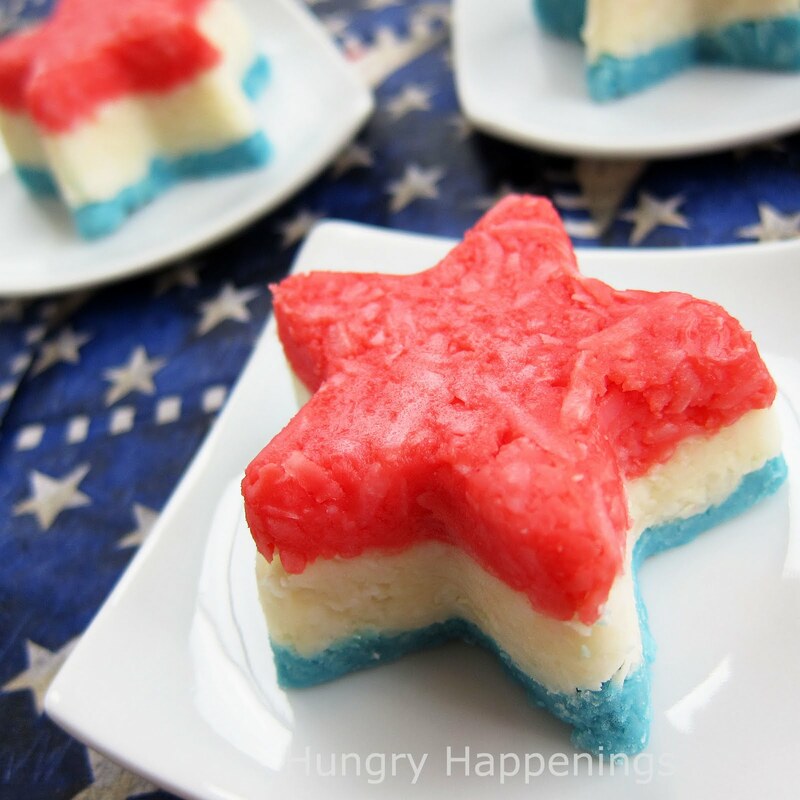 Make a dreamy dessert for your next patriotic themed party! These Red, White, and Blue Striped Creamy Coconut Stars are SO tasty and amazingly beautiful, you’re guest will eat these up in a flash! As a child, Fourth of July was as big a holiday as any other. My entire family would head off to the neighborhood pool for an amazing party complete with games, food, and prizes. My parents would settle in at a table with their friends, I’d politely say “hello” to everyone present, then run and jump into the pool. It wouldn’t be long before a loud gunshot would fire, signaling the start of the games. I loved competing, to see if I could swim the farthest underwater, make the biggest splash doing a cannon ball, or blow a balloon across the pool the fastest. One of my favorite games involved swimming across the pool with a ping pong ball on a spoon dangling precariously out of my mouth. A little wind and the hollow plastic ball would go skipping across the water, which meant I’d have grab the ball, race to the starting line, and begin again. Competing was always fun, winning was even better. But sometimes, no matter how hard I’d try, I’d lose. Each year, I’d convince my mom to swim with me in a mother/daughter relay race. I’d dive in and fly across the pool and be the first to touch the wall. My mother, wearing a frilly flower covered bathing cap that couldn’t possibly allow any water leakage, would slip into the pool, being careful not to splash water on her head and gracefully glide across the pool at a snails pace, driving me absolutely crazy. We’d cheer as loud as we could, but it never got her to the other wall any faster. Throughout the afternoon, I’d feast on burgers and a pot luck of food and would find myself diving face first into a pie, in an eating contest, of course. Also, every year I’d stuff my mouth full of marshmallows, and with cheeks puffed, try to say “chubby bunnies,” but inevitably would lose to my brother. He was the reigning chubby bunny champion for years. Once my belly was full, I’d spend time with my friends just hanging out under the sunlit sky, but I could never fully relax in anticipation of the last event of the day. Eventually, I’d hear a high pitched wine as the loudspeaker would click on, and before the announcer would even begin to speak, I’d be running for the pool’s edge. Minutes later, thousands of coins would fly through the air, hit the water with a splash, then glide to the bottom. Just before the gun would fire, I’d secure my goggles and pinpoint the silver dollars and quarters. Bang. I was at the bottom of the pool, holding my breath for what seemed like an eternity, so I could pick up more money than I’d earn in a summer’s worth of allowances. Needing oxygen was such a bother, but it would finally happen and I’d burst to the surface, grab a quick breath, and dive down, over and over, until the pool was free of cold hard cash. When I told my husband how I used to get so excited about scraping money up off the pool floor, he said, “oh, I bet you used that money to buy candy at the snack bar, right?” He knows me so well. 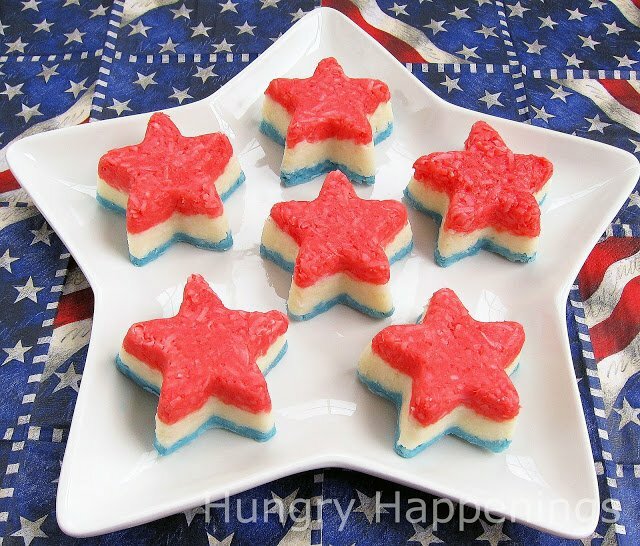 So, in that spirit, I’ve created a red, white, and blue star shaped candy to celebrate this year’s Independence Day. I’ve combined creamy white chocolate with cream of coconut and unsweetened flaked coconut to form a thick, mailable candy which I divided and colored, then pressed into a star shaped silicone mold . 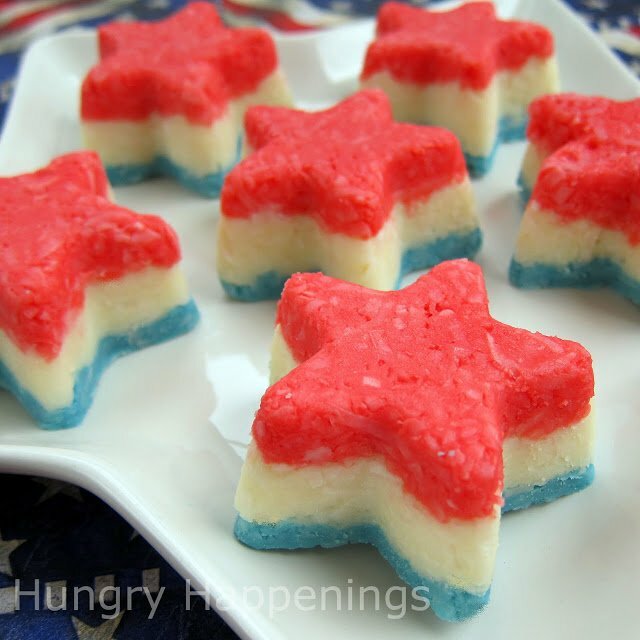 When un-molded each dessert sized candy is ablaze with layers of patriotic colors. I think they look amazing as star shaped candies, but if you don’t own or want to purchase a star mold, you can just line an 8″ square pan with non-stick aluminum foil, press in the layers of candy, freeze for an hour, remove from the pan, and cut it into squares. Of course, this candy can be made in any variety of colors (or plain white) and molded using any shape silicone mold for all of your special occasions. When you open the can of cream of coconut, there will be a very thick mass at the top of the can with liquid hiding underneath. Pour the contents of the can into a bowl. Stir it until well blended. Fill a 2 or 3 quart pan with one inch of water. Set the pan over low heat. Place the bowl of cream of coconut over the pan, making sure the bottom of the bowl does not touch the water. Stir in the white chocolate. Heat, stirring often, until melted. Remove from heat and lift bowl off the pan. Wipe the steam off the bottom of the bowl. Add coconut and stir until well blended. This mixture will get very thick, so use a sturdy spoon or spatula. Divide mixture into three bowls. I wanted my white layer to be thicker than the colored layers, so I didn’t divide the mixture into equal thirds, but you can if you’d like. Add ten drops of red coloring to one bowl and stir until well blended. Add more coloring, if needed. Make another bowl blue, using 10 or so drops of coloring. Refrigerate all three bowls for 15-20 minutes. If you attempt to put the candy into the silicone mold without chilling it first, it will be a sticky mess. Equally divide the red coconut mixture among 12 star cavities. Press the mixture into an even layer. Make sure you press down at the star tips, so that once un-molded your stars have nice even layers. Chill in the freezer for 10 minutes. Top with white mixture. Chill in the freezer for 10 minutes. Top with blue mixture. Make sure you clean around the edges of the mold, then freeze for an hour. Un-mold and place on serving platter. Allow to come up to room temperature before eating. These candies can be made well in advance of your celebration. Keep stored in an airtight container for up to two weeks. Items used to make this project that are available on Amazon.com. Previous Post: « Father’s Day is tomorrow. Have you made a special treat for Dad? Those are gorgeous!! What a great idea, they turned out really nice and perfect for a 4th of July treat! 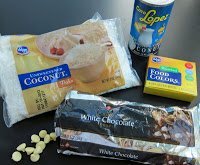 if i cannot find the brand of coconut cream you use, what would be a good substitute? Hi Anonymous, there are several different brands of cream of coconut and I have used at least three with good results when making coconut chocolate truffles. I can just eat it right out of the can, it is so delicious. Just make sure to use cream of coconut/coconut cream, not coconut milk. hi! i don't usually follow food blogs, but your's looks fabulous! thanks for the inspiration and the know-how. I don't have the molds, but will try these as squares, hopefully tomorrow! Hi Beth D. I'm so happy that you decided to follow me here at Hungry Happenings. Glad you liked my recipe and were inspired to make them. I'm sure they will look great as red, white, and blue squares. Happy 4th of July. I made these this year for the fourth(but I shaped them into flags), they were a hit- thank you so much for posting this! Hi ween 76, so happy to hear you made these and that they were a hit. I really love the flavor of these candies. If you took any pictures of your flag shaped candies, I'd love to see them and share them with everyone. Did you use a mold to make your flags, or did you mold them by hand? These are so beautiful and I bet they taste amazing! 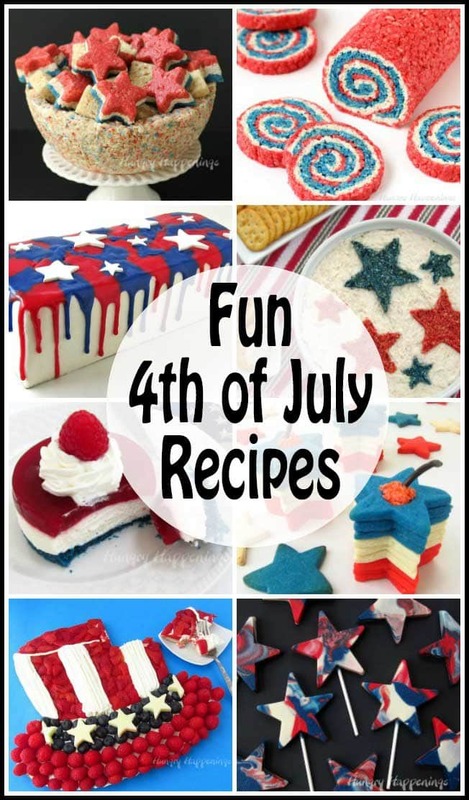 Thanks so much for linking up to my Red, White, Blue & You Link Party! Very cool idea and these look amazingly beautiful! I love these. You know me and coconut!!! I too am a coconut fan! I love that it can be colored easily and can be used in so many edible crafts. These are awesome looking! ANd I bet they are delicious!!! These are awesome! i already invite you on another post, but I would love to have you join the Red white and blue linky! These look so tasty. I coming to you via the Lady Behind the Curtain's Cast Party Wednesdays. I love this recipe! There aren't enough recipes with coconut floating around. And what a beautiful story from your childhood. Sounds like you lived a wonderful family oriented neighborhood! Thanks for stopping by! I did live in a really great neighborhood. I have fun memories of that time of my life. Those look great. I have pined them. Where can I find the star molds? I canny wait to try this recipe!! Hi Tiffany, I just added a link in the blog post to Amazon.com where you can buy the molds. You can also find them at cake/candy decorating stores, or craft stores like Michael's or JoAnn Fabrics. If I don't have a star mold but i have a star shaped cookie cutter. Would this work if i did it in a deep style pan, and use the cookie cutter to cut out the shapes after I do all the steps? ?